Eight years ago, Dan Sherman moved his very successful landscape design business from Manhattan to a cozy office overlooking a brook in Valhalla. It just stopped making sense to make the commute into the city from his longtime home in Piermont and then back out again to meet with clients, most of whom live in Westchester or Connecticut. "We are so central to everything in the Westchester and south Fairfield area," says Sherman, who has been working as a landscape architect since 1977. "As soon as we moved, I bought a boatload of Stickley furniture and did the office up in a cozy Mission style, like a home office studio." His six-person team includes a senior landscape architect who is "great with contractors, building departments, tree and plant vendors and helps track work in construction" and two young landscape architects who keep him fresh. They "chomp through designs, drafting, details, permits and clients' endless emails." Sherman's design projects have ranged from the small and local (and pro bono) — the Piermont Community Garden, Main Street planters, Piermont dog park and the war memorials in town — to the grandiose and international: giant and elegant office parks in France and U.S. Air Force bases in Germany. He has also renovated a half-dozen campuses for Atria Senior Living, including ones in Ossining and Albany. People with large estates in Greenwich, Southampton and Westchester keep him busy, too. "Mostly my clients are captains of finance and industry — and loads of hard-working people who love their homes and aspire to a better landscape." Moonlighting while working full time for another firm, Sherman had created a brownstone garden for the foundation on East 18th Street and was subsequently taken to LuEsther's grand home in Port Washington. "At a party, a Tarot reading was laid out for me and the past, present and future were told with astonishing and accurate clarity," he remembers. "I made the daring jump the next day." 2.His partner of 21 years is Richard Skipper, a performer best known these days for his full-length shows impersonating Carol Channing. "They are very good friends, and he is her official tribute artist," Sherman says. 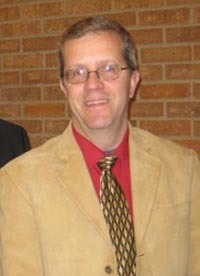 Skipper is also co-producer of the New York Bistro Awards and is very involved with the New York cabaret community. He's performed at the Rockland Center for the Arts and is a frequent guest performer at various benefits and fund-raisers around Rockland. 3. Sherman got at this gardening thing very early. Growing up in Lewiston, N.Y. (near Niagara Falls), "we had two neighbors who had very interesting and complicated gardens that fascinated me," he remembers. "My birthday is at the end of April and my mother would buy me a bale of peat moss and flats of flowers to plant around the house. I was happy — who knew?" 4.His best-known client is probably Derek Jeter, who hired Sherman to create a landscape for a Scottishs-tyle castle on Greenwood Lake in Warwick. "I worked closely with Derek's mom, Dot, on the project," he says. "She is very respectful and nurturing and a lot of fun to work with." 5. He's a founding member of the Piermont Community Garden and he's had a plot there every year since the garden got going in 1995. 6. Some of his favorite plants right now include variegated Solomon's seal, Indian pinkroot, ajuga, epimedium, cranesbill geranium 'Rozanne' and dark pink double Knock Out roses. 7.For a cool combo in his own garden, he sends morning glories climbing up his 'Annabelle' hydrangeas. "It looks amazing in the morning with the blue flowers all over the white flowers." And he's got fall-blooming clematis climbing up inside a lilac tree in his front yard. 8. He hasn't yet, but he would love to work on historic properties. "I haven't figured out how to steer my career in that direction, so it's exciting that the kind of work I would most like to do is still out there to learn and do." 9. When he's not in Valhalla, Piermont or Manhattan, you'll likely find him at his cottage on a lake in northern Ontario. "This was our family's camp for 40 years," he says, which he bought two years ago when his parents decided they shouldn't be someplace so remote. Now Sherman coordinates the upkeep and vacation schedules of various family members. 10. Because of his partner's involvement with the cabaret scene, Sherman has a very busy social life — out attending shows and receptions at least three nights a week. "I would probably not pull myself out of the garden and clients' landscapes if I weren't compelled, but New York has a very rich and underrated world of off-the-chart entertainers — it's pretty amazing." He also likes to tag along when Skipper takes his show on the road. "We were out in Palm Springs in February to stay with Carol Channing," Sherman says. "Everyday something new pops up with Ruth Buzzi, Tommy Tune, Mitzi Gaynor or Julie Wilson." Garden designer by day, bon vivant by night. Sounds pretty great, doesn't it? Bluewater is pleased to announce a special comic book project featuring one of the most beloved and widely known figures in the history of American culture, the legendary Lucille Ball. “Comics: Lucille Ball” will be released in August 2011 and have a cover price of $3.99, just in time to celebrate her 100th birthday. Written by Jaymes Reed and drawn by Patricio Carbajal. Lucille Ball is arguably the most influential figure in the history of American television. This comic will focus on her humble beginnings and the incredible events that led to her eventually becoming a household name at a time when that meant virtually every American household as the star of the classic” I Love Lucy" program. Though she would pave the way for many female comediennes that came after her, she towers over the rest. There is still only one Lucy. This book shows the influences on her comedy that still influence every person who tries to make a living making others laugh. “The series as a whole was created to help me laugh during terrible times following my mother's death on New Year's Eve 2009. 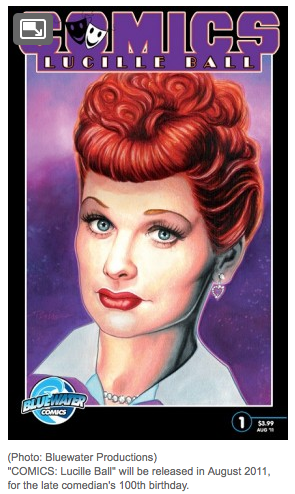 When preparing the initial line-up for the COMICS series, I knew right away a Lucille Ball book would be near the top. Besides for being the Queen of Comedy, she was my mother's favorite television personality, nearly to the point of serious addiction. I grew up on corn flakes, Texas sunshine... and each episode of everything Lucy ever starred in! "COMICS: Lucille Ball" will partly feature my mom as a little girl and will also be dedicated to her memory." Publisher Darren G. Davis said, “ Our goal is to show the little-known events and influences that resulted in Lucille Ball becoming the phenomenon she remains to this day, 100 years after her birth and years after her death. A visual medium provides perspective that is not only accessible but more relatable to the average person without losing any of the information involved”. This 32-page comic book will be chronicling this saga, “COMICS: Lucille Ball ” will explore all sides of this amazing talent, from her positive contribution to her fans' lives and society at large and how she is one of the few celebrities hardly anyone says a bad word about. Through it all, she always remained true to herself and appeared to be genuine. What you saw is what you got with her. There didn't appear to be a phony bone in her body. That - and her remarkable talent - is what has made her an enduring legend. Interest is still strong and steadfast for one of the most powerful women in the history of entertainment. Join Bluewater Productions as we examine the life-affirming journey of Lucille Ball and how she became the ultimate American story and forever remembered as the Queen of Comedy. Oy! What a day I had today!!! I was woken up at 3:35 AM this morning along with perhaps half the neighborhood. Some screeching, then BANG!!! (some more screeching) then BANG!!! BANG!!! BOOM!!! Then the car alarms set off. I jumped up off the sofa in the living room, threw off my robe put on my pants and shoes and ran out to see what had happened. 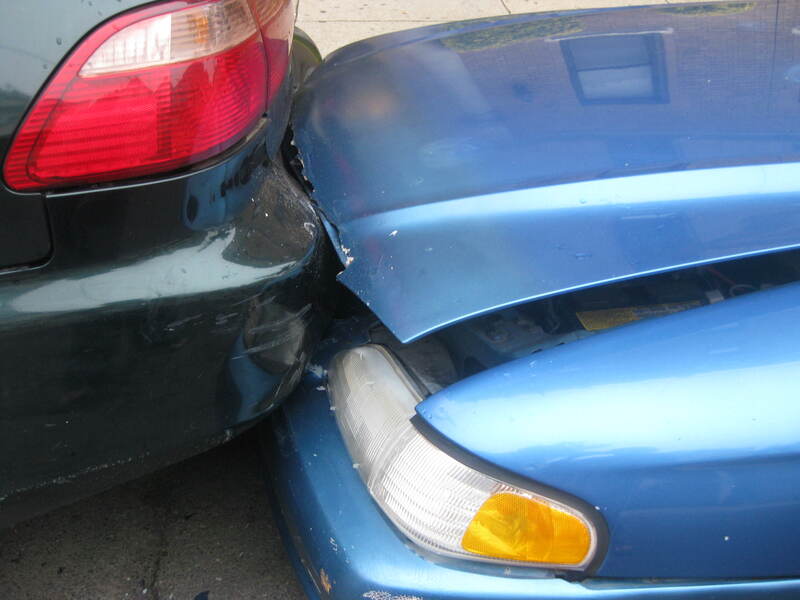 It looked like my car had been hit along with the car in front of mine and the car in front of that one. I ran back inside to get my cellphone and my camera. Came back out to the car and examined the whole thing. 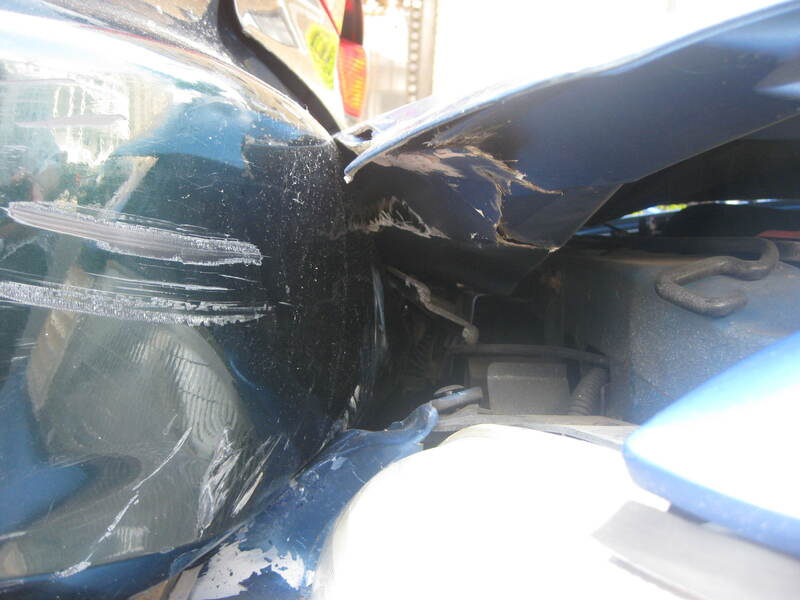 My car was severely damaged on the left rear tire, drivers side door and front hood. The front of the car had been crashed into the car parked in front of mine and that car was crashed into the car in front of it. While I was on the phone explaining to the police dispatcher where, when what where who and all that, some kids came running from around the corner on Bond St. yelling, "He's stuck around the corner, go catch him. He's stuck, can't go anywhere." So I went running around there and at the top of the hill on Bond St. was the car trying to back out of a turn into the curb to get away, was the car that just hit mine. I quickly took a picture of the license plate then went up to the driver and stalled him till the police arrived. When they did, they told me and Abdellatif, the guy who owns the car that my car got pushed into, to wait back around the corner with our cars. We both walked back to our cars and waited. After 20 minutes the police hadn't come over to us yet so we walked back up around the corner to find the kids car was being towed and the kid was watching from the sidewalk. I was curious as to why he wasn't in handcuffs or sitting in the back of the police car. But he was right there out in the open watching his car going up on the lift. I asked a few of the officers standing around watching this whole thing and they couldn't answer me. It made me angry. Then I noticed one of the officers that was taking the report start walking down the street and around over to our cars. we followed. When we reached our cars, the officer took Abdellatiff's report first, then mine. I was prepared with my registration and insurance info. The officer said that the kid was "A little slow", "Mentally challenged" Well, it makes you wonder why and how they give drivers licenses to these kind of people. Anyway, he also had full insurance coverage. That's all that mattered here. His insurance would pay for the work that our cars needed to be repaired if this was possible. Abdellatiff's car looks like all it needs is a rear and front bumper and a hood. My car needs a bit more. It may need rear alignment, a drivers side door, a hood, a bumper, new tires and wheel hubs and possibly rear axle work. At 7 AM my doorbell rang. I jumped up off the sofa, threw my robe off, put my pants on and ran downstairs to see that it was my landlady who was letting me know what happened to my car. I told her I knew. I explained all that went on this morning. It was then I learned that the fore-most car in this lineup of parked cars was none other than hers. A black PILOT. One of those bigger SUV-type looking cars. She was lucky because when she got in and started it up and pulled away, the car behind hers which was Abdellatiff's, fell off her bumper and his car alarm went off again. Not a scratch on her car. She then pulled it into her driveway and that was that. At about 7:45 AM another neighbor who was passing by saw my car and decided to ring my bell to let me know. I told him thanks, I already know about it and began the explanation all over again of the 3:35AM events. At 10:30AM I called my insurance company and filled the claim. They will get the police report, contact the kids insurance company, send an adjuster out to estimate my car damage and let me know the outcome. This should all come within the next three or four days. But the adjuster will call me to come out Monday or Tuesday. At 11AM i had to leave for a doctors appointment in Brooklyn at 1 PM. I got there on time and didn't wonder at all why my blood pressure was elevated a bit today. When I got back home from the appointment, Abdellatiff was outside taking better pics of his car. He had taken some early in the morning but I told him it would be better later when the sun was up. After all- the cars weren't going anywhere. We also decided at that point that he should start up his car and move it forward to get it off of my car so he can get better pics of his rear bumper and I can get better pics of the front of my car. I picked up out from the front hood and light debris, my mustang emblem. I want that if nothing else can be saved or fixed. 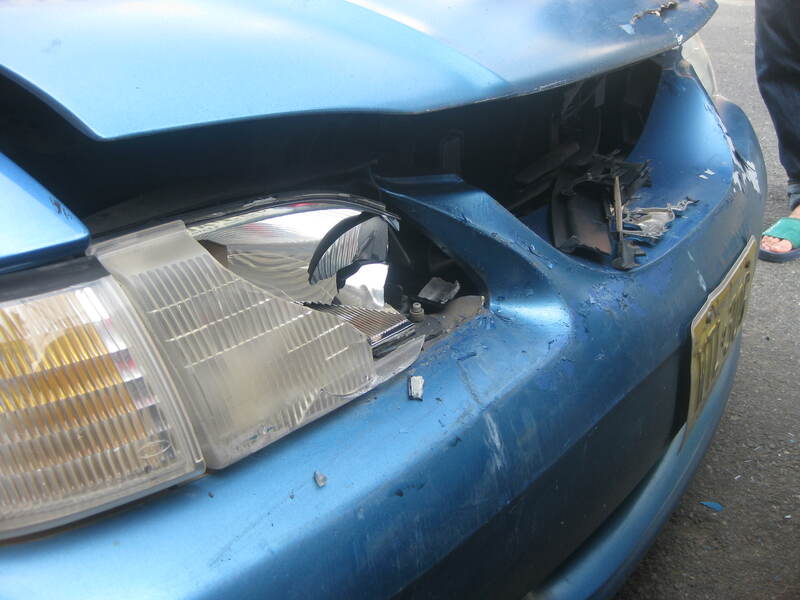 By now, the car was looked at by both my own insurance company and the driver who hit the car's insurance company. Both companies have declared the car "totaled" meaning it would cost more to have it fixed than the whole car is worth. My Ins. Co. gave me two prices. One was if they take the car and the other was if I keep the car. The difference between the two was only $25.00 so I decided to hold off and let the other company make their decision. I'll find out about it next week. Meanwhile, the car can't sit on the street any longer because it will get ticketed by the parking authority. So, yesterday I was on the phone with companies that pay cash for junk cars and today, one of them came to get the car to take it away. A few stills of the final moments with the car: Click Here. 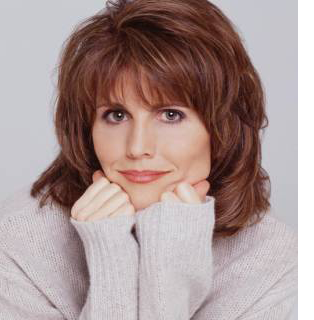 Lucie Arnaz evokes memories of her famous parents, Lucille Ball and Desi Arnaz, when she visits the Landmark Theater in Port Washington with “Latin Roots,” on Saturday, June 18, at 8 p.m.
Arnaz returns to Long Island with a powerful reinterpretation of the American Songbook to honor and celebrate her father and his Latin roots. Growing up in the public eye with her beloved parents and brother Desi Arnaz IV, Arnaz has demonstrated her many talents throughout the years as an actress, singer, dancer, business executive, producer, director, and Broadway star. Tickets are $45 and $40; available at (516) 767-6444 or www.landmarkonmainstreet.org. Jeanne Rimsky Theater, 232 Main St., Port Washington.